With a choice of 272 hotel rooms in Belfast City Centre – including 92 Executive Bedrooms and Suites. The elegant décor, contemporary bistro, bustling bar and relaxing piano bar lounge make the four star Europa Hotel the hotel of choice for business and leisure guests visiting Belfast. 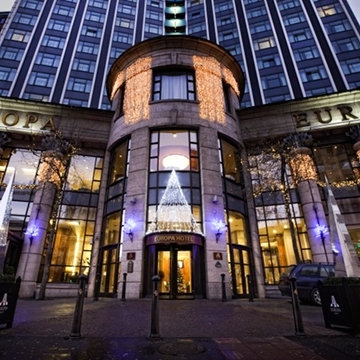 Due to its prime location, the Europa Hotel is a short distance from many of Belfast’s top visitor attractions including the Ulster Museum, Grand Opera House, City Hall, Titanic Belfast, the Waterfront Hall and the Odyssey Arena.